The Skoda Fabia R5 will return to the CAMS Australian Rally Championship (ARC) in 2019 with John O’Dowd behind the wheel of the world-class car. Teamed up alongside his co-driver Toni Feaver, the reigning Western Australian rally champion secured Eli Evans’ 2018 winning car through Race Torque and has committed to the full ARC season in it. With his last taste of ARC glory being in 2017 in the ARC2 title, O’Dowd was thrilled he could obtain a car with an impressive history as he looks to build on his rally career. “This is a massive step forward for me,” O’Dowd said. “Below WRC level, the Skoda R5 is clearly the car to have. Skoda have been developing the Fabia R5 for years, and it has been successful all over the world. In previous years, O’Dowd has campaigned in the WARC and ARC in production-based Subaru WRX STIs, making his a move to the Skoda a bold one. While he picked up his first state title in a Subaru last year, O’Dowd is hoping a new car, new team and a boost in confidence gives him a good shot for both national and state titles in 2019. “It was great to get my first state title under the belt in 2018. I’d love to repeat it again this year,” O’Dowd added. “It’s going to be a massive jump (to the Skoda). These cars have more suspension travel, better brakes, and more power on tap. Plus it is left-hand drive, so that will take a bit of getting used to. But I’m really excited to step into a car that can compete with the best crews in the ARC. “Although I own the car, Race Torque are looking after the preparation and servicing for me. So I’ve got one of the best teams in the country. 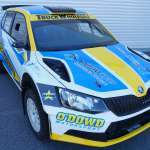 O’Dowd’s entry with the Skoda will be the second consecutive year that the Make Smoking History Forest Rally has introduced the WRC spec car, with Evans and Adrian Coppin both debuting the Skoda at last year’s event. The Make Smoking History Forest Rally kicks off the 2019 ARC season on 5-7 April with the free Trade Hire Busselton Super Special Stage on Friday and Saturday nights, as well as the day-to-day action around the forests of nearby Nannup.